This memorandum transmits the Local Mitigation Plan Review Guide for use by FEMA Regions and States to complete reviews of Local Mitigation Plans. The Local Mitigation Planning Handbook (Handbook) is the official guide for local governments to develop, update and implement local mitigation plans. While the requirements under §201.6 have not changed, the Handbook provides guidance to local governments on developing or updating hazard mitigation plans to meet the requirements under the Code of Federal Regulations (CFR) Title 44 – Emergency Management and Assistance §201.6, Local Mitigation Plans for FEMA approval and eligibility to apply for FEMA Hazard Mitigation Assistance grant programs. It also offers practical approaches, tools, worksheets and local mitigation planning examples for how communities can engage in effective planning to reduce long-term risk from natural hazards and disasters. The Handbook complements and liberally references the Local Mitigation Plan Review Guide (October 1, 2011), which is the official guidance for Federal and State officials responsible for reviewing local mitigation plans in a fair and consistent manner. This policy describes the implications to State, Tribal and Local governments that do not have a FEMA-approved hazard mitigation plan relative to receiving assistance under eligible FEMA grant programs. It also conveys key information for FEMA to continue to communicate to State, Tribal and Local governments. Section 110 of the Flood Disaster Protection Act of 1973 (Public Law 93-234), hereafter referred to as the Act, is intended to ensure an equitable balancing of all interests involved in the setting of new and modified Base (1-percent-annual-chance) Flood Elevation (BFE) determinations. The Act provides for an explicit process of notification and appeals for community officials and for private persons prior to the Federal Emergency Management Agency (FEMA) making the BFE determinations final. “Community” as used in the Act and in this Procedure Memorandum means a community participating in, or in the process of joining, the National Flood Insurance Program (NFIP). The State Mitigation Plan Review Guide is FEMA’s official policy on, and interpretation of, the requirements for State Standard and Enhanced Mitigation Planning found at 44 Code of Federal Regulations Part 201 Mitigation Planning. The intended use of the State Mitigation Plan Review Guide is to facilitate consistent evaluation and approval of State Mitigation Plans as well as to facilitate State compliance with the mitigation planning requirements when updating plans. Hazard mitigation is defined as sustained action taken to reduce or eliminate long-term risk to human life and property from hazards. integrate that information into local and state hazard mitigation and other planning processes. 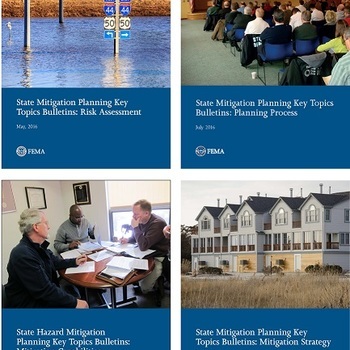 This guide may be used in conjunction with FEMA’s Local Mitigation Planning Handbook 2, which is the official guide for local governments to develop, update, and implement local mitigation plans. The intent of this guide is to draw from various existing guidance and operations documents and provide users with a clear picture of how the data and information that come out of a natural hazard disaster can be filtered back into the local hazard mitigation planning process to help improve local natural hazard risk reduction actions and strategies. These documents are FEMA policies or policy memos that have been superseded. To view FEMA’s current hazard mitigation planning policies, visit the Hazard Mitigation Planning Laws, Regulations, & Policies page. FEMA is updating its policy that guides how Agency officials interpret regulatory requirements in their review and approval of tribal mitigation plans. This updated policy, titled the “Tribal Mitigation Plan Review Guide,” will supersede FEMA’s current Tribal Multi-Hazard Mitigation Planning Guidance (Guidance), issued in 2010. The goal of this update is to simplify the Guidance, address key policy questions, and improve alignment with similar FEMA policies on state and local mitigation planning. The Federal Emergency Management Agency (FEMA) released the State Mitigation Plan Review Guide in March 2015. This Guide, which became effective March 6, 2016, presents FEMA’s official policy on and interpretation of the natural hazard mitigation planning requirements for states established in the Code of Federal Regulations (44 CFR Part 201). The State Mitigation Planning Key Topics Bulletins (“Bulletins”) are a series of brief documents aimed at informing states on how to meet the regulatory and policy requirements described in the Guide. The series covers all components of the mitigation planning process. The Bulletins are not intended to clarify policy, but instead to provide state officials approaches and resources for updating state hazard mitigation plans. As a part of addressing the 2016 Memorandum and Federal Action Plan on Building National Capabilities for Long-Term Drought Resilience, FEMA developed this fact sheet to outline the ways hazard mitigation planning supports drought planning and capacity building. This fact sheet describes how hazard mitigation supports drought resilience throughout the planning process, in the risk assessment, and in the mitigation strategy. It also discusses how drought hazard mitigation can be integrated into other planning initiatives. These documents include the sources and locations of the flood hazard information available for the State of Texas, sorted by county and community. These documents include the sources and locations of the flood hazard information available for the State of Arkansas, sorted by county and community.